We’ve run several playtest day events in the past. These are really super cool days where a select number of people get to come to SFG HQ and play with some unreleased models! We’re planning on running another one of these in February, and we’re here to talk about that playtest event! What is a Playtest Event? A Playtest Event is a single day experience which takes place at The Game Forge. You’ll get to meet members of the Steamforged Games development team and see some secret new rules, models, or both! The rest of the day will be spent playing games with the secret new rules or models and discussing your findings with our development team. We can then use your feedback to help us finish development! This is your chance to get on the inside of Steamforged Games development and see for yourself what it’s like to play with unreleased rules or models. 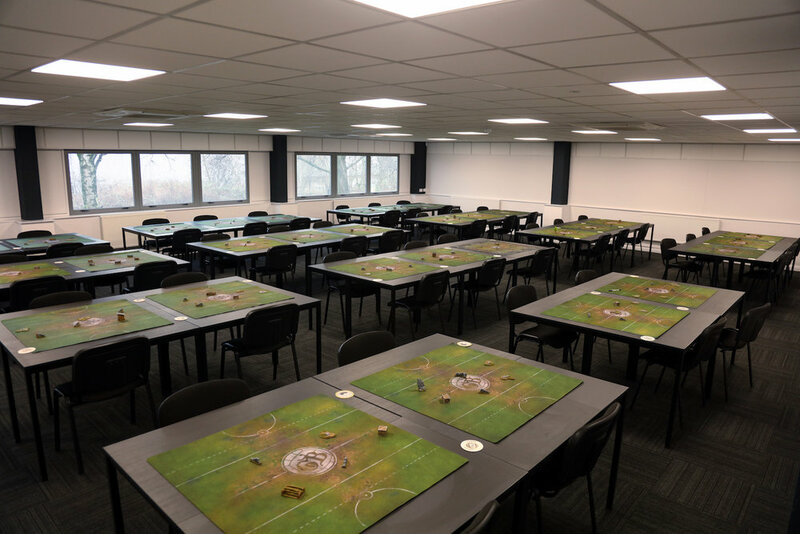 At our playtest events attendees are able to play at least three games during the day, playing both with and against numerous test models and rules, as well as discussing their findings with members of our development team. This relaxed atmosphere has proved to be enjoyable for everyone. Playtest events are a fantastic experience for any type of gamer whether you have experience of other Guild Ball events or not. Guild Ball Playtest Events start at 9:30am (ideally try to be there for 9am to sign in) and conclude at approximately 6pm. Attendees should expect to be able to play at least three games during the day with all playtesting materials being provided for you. However, it’s a good idea to bring your own gaming models, stat cards, measuring tools, tokens, and anything else you usually use during games of Guild Ball. Tea, coffee, soft drinks, and snacks will be available throughout the day. A free lunch is included in the price of your ticket, so please make sure to let us know about any special dietary requirements. Additionally, our onsite store will be open for the duration of the day in case you feel like picking up any of our latest releases! Ahhh, well, my friend. You’re in luck. Previous Playtest Events have always been run at the Game Forge in Manchester. While this makes a lot of sense for us since it’s at our HQ, we do keep getting asked by people outside the UK if there’s any chance of us doing one in their country. This seemed like a bit of an ask, but given that we love our community, we wanted to see if there was any way of doing it. So we spoke to our wonderful playtesters, and several of them were keen to run playtest events in their home countries! Therefore, on Saturday the 23rd of February, we’ll be running the event at the Game Forge in Manchester as normal. However, we’ll also have three ‘outpost’ playtest events on the same day, in Australia, Germany, and the USA. This is super exciting, because it gives people all around the world the chance to playtest these models just the same as someone near SFG HQ! This is the very first time we’re trying something like this out, and we’re really excited to see how it goes. You’ll be able to ask the playtesters running the outpost events questions and give them notes which they’ll send back to us, so your contributions will actively help make Guild Ball better! We’ll be intentionally keeping these outpost events limited in size as a trial run to see if this is something we can continue to do on a wider scale in the future. To this end, outpost events are generally limited to a maximum of 16 places. What Do We Get to Playtest? All of the Free Cities Draft models! You fought hard for your models during the online campaign, and now you get to test them out and see how they play. For all you Union players, not to fear, this includes Veteran Greede on Strongbox! Absolutely every Major Guild has a brand new model to play with, so everyone has a reason to come along and find out what your Guild’s new model looks like! Because these events are about testing rules that are unfinished, all attendees must sign a Non-Disclosure Agreement (NDA) before being allowed to see any of the playtest rules. Signing the NDA means that you aren’t allowed to discuss any unreleased rules or models seen during the day until they have been shown to the public by Steamforged Games. So, no going home and posting everything you found out on a forum, blog, or social media! Additionally, no mobile phones or other recording devices are allowed during the Playtest Event. Any mobile phones or recording devices must be securely stored by our staff for the duration of the event to keep them safe ( we have an emergency contact phone number for anyone that requires one). No written notes or playtesting materials will be allowed out of the building. The outpost events in Australia, Germany, and the USA will obey the same rules as the one at SFG HQ. Our intrepid playtesters will be keeping a VERY close eye on the events to make sure everything is done by the book! Remember, we can only continue to run playtest events if all the attendees obey the rules and don’t spoil anything they find out at a playtest event. So far everyone has been absolutely golden! Let’s keep it up! The Game Forge, Manchester, United Kingdom. Turn 4 Hobbytown, West Boylston, Massachusetts, USA. Your contact is Robert Wolff. Ludo Ergo Sum, Gliesmaroder Street, Braunschweig, Germany. Your contact is Tim Wischniowski. Jolt Games, 56 Hoskins Street, Mitchell, ACT, Australia. Your contact is Matt Graham.